This is the very popular, yet still somewhat underground book trilogy about a little girl named Lyra Belacqua. In a world that seems to be antique modern with magical properties, s he finds out that her estranged father is on some bizarre quest, thinking he knows the meaning of Dust and the locations of parallel worlds. Lyra decides she needs to intercede and take on her own quest. She also has the Alethiometer or the golden compass. This is a device that can tell you information about truth and what to do next. For some reason Lyra is able to use and read the device with an amazing intuition. Furthermore the adventure makes constant reference to the Bible and the Church which looks very similar to the same entities in our world. This is a first class fantasy adventure. The characters are deep, well written and fascinating. The worlds are very intricate and exciting. With books like this floating around, it makes me wonder why we have time for boy wizards who look more than second rate compared to this modern fairy tale. This reminds me of Tolkien where it’s not that they find a monster because we needed a monster here. Instead the world is so “real” and such a true work of “sub creation” that it seems like that monster just existed and they had to deal with it the same way someone would have to deal with a fierce reptile should they fall into the water while running through the Florida E verglades. This is a major plot point. Through their adventures they meet everyone, from the harpies that guard the afterlife , to the angels and Enoch (now head of the angels). They even meet God himself. What you find out is that every world has a story where there was something that a snake told them to partake in. This was the thing that would help people become everything they are. The church would then go in and teach the people that the snake was lying and the object of their fulfillment is actually a sin. So we must go with our passions. This becomes more complete when she travels to the afterlife. There everyone is stuck until Lyra convinces them to stop torturing people and lead them out to where they can become one with the universes. The creatures agree as long as people have good stories of their life to tell them in exchange for their guiding. When people from our world come to theirs , they find that their soul is an animal and the opposite gender. They also learn that what they had always been told was evil ( namely, dæmons) are is actually your true self guiding you. All of this sounds like the gospel according to Neitchze but then, how does God fit in? Turns out he’s just the oldest angel, so everyone thought he created everything. Now he’s a feeble old man being kept ceremoniously alive – what to do? Euthanasia! This is wonderfully written and phenomenally entertaining. This is also a well crafted explanation of a philosophy. In a way that is understandable and lasting, we learn that we just need to do everything we feel, and anyone telling you that you shouldn’t is lying to you so they can have power over you. It also explains that the most blatant offender calls themselves the church. Those who say the serpent lied, are liers themselves. Thus this book series is a well crafted gun aimed at the ideals of your children. Like the idols in the book of Jeremiah, the fact that it is well crafted by skilled men should not blind us to the fact that it is evil. This book series may have gained the popularity the writing deserves when the first movie came out, but the movie just fizeled. It is put out by New Line Cinema and the first adds for it use “the one ring” from Lord of the Rings to try to connect the two series. These films will appeal to kids who liked the others (LotR, Narnia, Harry Potter), but they are not the same. 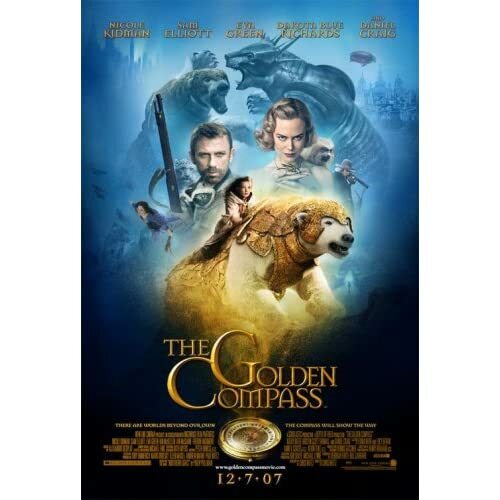 The Golden Compass will provide another reiteration of a sad philosophy that can only hurt. Oddly enough, despite the humanistic philosophy (and the mercy killing of God) , I have had many Christians recommend this book as Christian Fiction. We need to take this for what it is, good literature with bad theology. If people you know are into this book, it is well worth lots of discussion. If you kids are not yet into this book, it is well worth preparing now to shield them from the forth coming advertising onslaught. Philip Pullman‘s well written Neo-Nietzschean fantasy trilogy is swept up into production, as New Line Cinema hopes to find the next Lord of the Rings style film, and income. The series begins with Lyra, (Dakota Blue Richards) a 12 year old orphan girl living at a prestigious boarding school in a parallel universe to ours, where architecture and fashion are a mix of sci-fi and the 40’s. In this world, a person’s sole does not live in them, but stays near them in an animal form called a daemon. Lyra’s daemon can change it’s form because she is still a child and her soul has not settled, but an adult daemon is constant. It was a well crafted story, but the presentation suffered in comparison to almost everything it begs to be compared too. This is not as good as the book. Much of the mystery is gone when an added opening monologue reveals that we are in a parallel universe, and many other things that are not explained right away in the book. The universe concept is not fully revealed until the second book. The opening Monologue is also done by a woman with a deep voice and English accent. This reveals that the links to Lord of the Rings run deeper than the ad campaign. There were a few parts where they used film short hand that was taught to us in Lord of the Rings. Instead of developing the witches they are just a race like Middle Earth’s elves. The talking animals hearken to Narnia, but not the special effects. Outside of the Bears, most animals are off screen or looking the other way when they talk. I’m sure this was because the few times we are allowed to see it, their mouths do not totally line up. The little girl at the center will also bring thoughts of Lucy of Narnia and Harmonie of Harry Potter. This comparison puts them in good with Narnia, and for all it’s faults, unlike the Potter films, this is not long and dull. This story was compelling and made you want to know what was next. When I read the book, the idea of a little girl riding an armored polar bear (ice bear) was thrilling to me. To see it, despite occasionally looking like a Coke commercial, was just as thrilling. The bear, voiced by Gandalf/Magneto actor Ian McKellen, is the best part of this film. It was made for kids. The PG-13 rating is well deserved, but mature children could handle the action. There are a lot of children in peril, but the only truly disturbing shot (spoiler) is when one Armored Ice Bear slaps the others jaw off and into the camera. Still even this is done so fast, and covered so quickly, that it’s more about the disturbing idea than the visual. If they could handle Spider man 3 or Narnia, this will not be a problem. Happily, despite the posters, We do not get revealing shots of the two prominent women in the film. You can check Screenit.com for a break down of everything on the screen. This movie is based on a trilogy entitled “His Dark Materials.” The name comes from a line about Satan in the book “Paradise Lost” by Milton. There are many references in the book to Milton and even quotes from him at the beginning of most chapters. 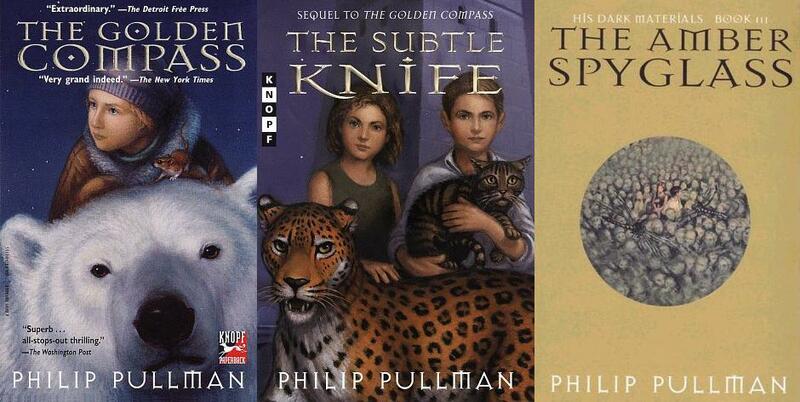 This is to point out author Philip Pullman‘s opposite Thesis. Milton wrote to explain to men why they should follow the rule of God. Pullman wrote to teach children why they should not. As a film, this movie is watchable and as morality, this movie is damnable. Still without the direct connections to the church made for us, the message is identical to the “rules are not for me” messages of the Harry Potter films. There are worse films out there, but if you, or your kids miss this one, you are not missing much. Save your $7.50 and stay home with Narnia. It has all the same fantasy elements but on a higher scale of excellence, with a message you will want to endorse. You are currently browsing the archives for the The Golden Compass category.